Would you walk into an important business meeting in a tank top and sandals? Impressions are all about presentation, so why not dress up your documents to help stand out professionally. If looking professional is important, then quality, company branded presentation folders are a must! They can make the difference when presenting to a potential client. 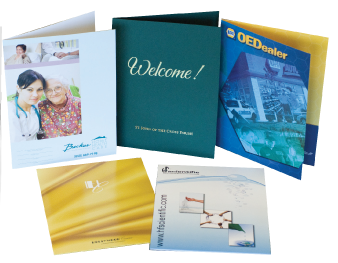 We can produce presentation folders in any color or size. These can be printed in a single ink or professionally embossed or foil stamped to create a lasting image. Additional options include business card slits and printed pockets.